Integrated, patent-pending venting channels dramatically reduce the force required to remove a filled can liner. Improved ProTouch™ handles provide a fully rounded, comfortable grip. Can liner cinches allow easy, one-step bag retention. Double-ribbed base and reinforced rim for increased strength and stability. Lid sold separately. Container size: 24 dia. x 31-1/2h. Shpg. wt. 49.5 lbs. Standards #21 “Thermoplastic Refuse Containers." 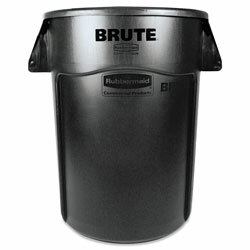 Black Outdoor Trash Cans from Rubbermaid! 314 In Stock today.